Those looking for perfectly-toned pop need to wait only until February 5th. That's when Delaware's Spinto Band release their new album Cool Cocoon. The record is a collection of little indie pop nuggets of pure delight. The Spinto Band are far from conventional in how they arrive at their destination though. Nowhere is that more evident than on "She Don't Want Me", which is the perfect union of Beach Boys harmonies and Of Montreal quirk. The key to The Spinto Band sound is that, regardless of you mood, it will put a smile on your face. The lead single "Shake It Off" is laid back yet invigorating melodic trip. "What I Love" is a gorgeous ode that's seems destined to be a wedding staple for those in the know. Few hooks are as sharp of dig as deeply as the ones you'll hear coming your way on "Enemy". The most introspective moment comes courtesy of "Look Away". The stripped down song is rich feeling, providing a jaw-dropping depth. The tempo gets ratcheted up on "Amy + Jen", but the focus gets placed on vocal harmonies rather than on increasing the bombast in the arrangement to match the pace. It's like a more uplifting Belle & Sebastian track. 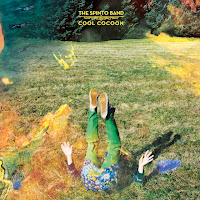 Cool Cocoon may very well be the first truly great record of 2013. It will be in your heavy rotation all year long. Best tracks: "Shake It Off", "Enemy"